Visit Rochester’s Group Tour and Travel Trade Committee is hosting 35 group tour organizers and guests from the Pittsburgh, PA area Wednesday-Friday, October 17-19th. The familiarization/sales program is in conjunction with the Pittsburgh, Pennsylvania AAA Group Travel Department. Three days in the area will be filled with activities and programs demonstrating why Greater Rochester is a great destination for year-round group tours. Six (6) remaining opportunities for your interaction with these tour planners and have them learn of your interest in their future business. Please click the image below to open and download a PDF of the six remaining opportunities. 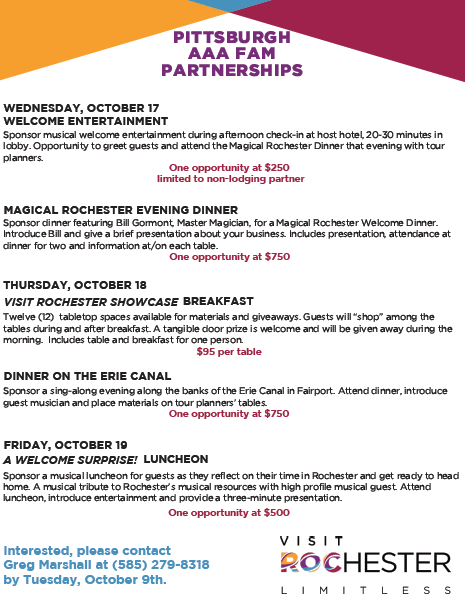 Interested members, please contact Greg Marshall (585-279-8318) at Visit Rochester by Tuesday, October 9th at noon. We will accommodate those interested as in the order commitments are made. These are great opportunities to capture a share of Rochester’s group tour business as well as to spend time with fellow members involved tourism marketing.